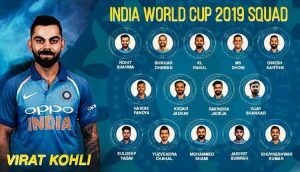 MUMBAI – India have announced a 15-member squad to be led by Virat Kohli for the 2019 Cricket World Cup in England. India squad: Virat Kohli, Rohit Sharma (vice-captain), Shikhar Dhawan, Vijay Shankar, KL Rahul, Dinesh Karthik, Yuzvendra Chahal, MS Dhoni, Kedar Jadhav, Kuldeep Yadav, Bhuvneshwar Kumar, Jasprit Bumrah, Hardik Pandya, R Jadeja, Mohammed Shami. While most members of the squad were automatic selections after their consistent performances over the last few years, the selection committee, headed by Prasad, had to make a crucial call when it came to the No. 4 spot and the fourth pacer for the World Cup team. India had tried close to 10 batsmen at the No. 4 spot over the last two years but found little success. Seasoned Hyderabad campaigner Amabati Rayudu seemed to have sealed the berth with some consistent performances in 2018 but the dip in his form was a huge cause of concern for Virat Kohli’s men. He amassed 392 runs, including a century and three fifties in just 10 innings at an impressive average of 56.00. However, in 2019, Rayudu has scored just 247 runs from 10 matches at a below-par average of 30.87. On the other hand, the decision of whether or not to take a specialist backup wicketkeeper-batsman for MS Dhoni dominated the narrative in the buildup to the World Cup squad selection. World Cup-winning off-spinner Harbhajan Singh had said there isn’t a need for the extra wicketkeeper in the squad and that KL Rahul is good enough to keep wickets if MS Dhoni picked up injuries at the World Cup. Meanwhile, India begin their World Cup campaign against South Africa in Southampton on June 5. With all 10 teams at the World Cup part of the round-robin group stage, Virat Kohli’s men will play a total of nine matches before the knockout stages, starting July 9. The 2019 World Cup will be held between May 30 and July 14. India also play a couple of warm-up matches in the lead up to the tournament proper. The Asian giants will face New Zealand in London on May 25 and Bangladesh in Cardiff on May 28.